The new leadership minor from Cornell CALS is aimed at developing skills in community engagement, service learning and leadership. 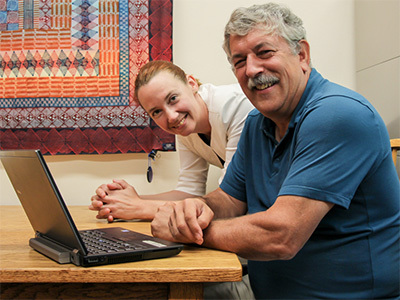 The new minor is directed by Professor Marvin Pritts, right, pictured with Leah Cook, plant sciences major coordinator, in the School of Integrative Plant Science. 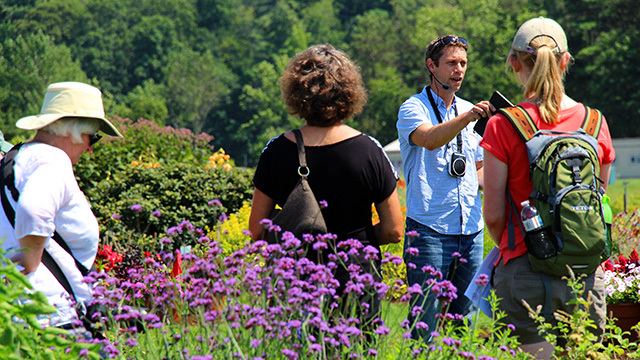 The minor provides opportunities for direct, hands-on experience, said Marvin Pritts, professor of horticulture and director of the new minor program. Through a capstone course, students can practice leadership skills in real time, working in their field alongside a faculty member who provides feedback. Students can earn this credit for leadership roles in extra-curricular activities, such as serving as captain of a sports team. 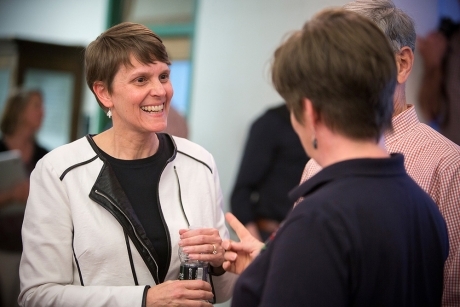 Pritts said the idea for the minor grew out of a desire to formally provide integration and academic credit for the many leadership opportunities that exist at Cornell, both inside and outside of the classroom. Yang Bai (Ph.D. Horticulture ’14), post-doctoral scientist at the Boyce Thompson Institute (BTI) is first author of the Nature Communications journal article Genome re-sequencing reveals the history of apple and supports a two-stage model for fruit enlargement featured in this BIT News article by Alexa Schmitz. Bai’s research was also featured in The Guardian. Centuries ago, the ancient networks of the Silk Road facilitated a political and economic openness between the nations of Eurasia. But this network also opened pathways for genetic exchange that shaped one of the world’s most popular fruits: the apple. As travelers journeyed east and west along the Silk Road, trading their goods and ideas, they brought with them hitchhiking apple seeds, discarded from the choicest fruit they pulled from wild trees. This early selection would eventually lead to the 7,500 varieties of apple that exist today. Researchers at Boyce Thompson Institute (BTI) have been working hard to excavate the mysteries of the apple’s evolutionary history, and a new publication this week in Nature Communications reveals surprising insights into the genetic exchange that brought us today’s modern, domesticated apple, Malus domestica. In collaboration with scientists from Cornell University and Shandong Agricultural University in China, the researchers sequenced and compared the genomes of 117 diverse apple accessions, including M. domestica and 23 wild species from North America, Europe, and East and central Asia. The most exciting outcome of this genomic comparison is a comprehensive map of the apple’s evolutionary history. Previous studies have shown that the common apple, Malus domestica arose from the central Asian wild apple, Malus sieversii, with contributions from crabapples along the Silk Road as it was brought west to Europe. With the results of this new study, the researchers could zoom in on the map for better resolution. 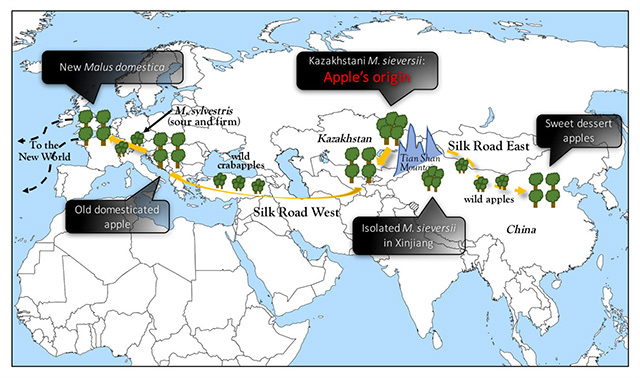 “We narrowed down the origin of domesticated apple from very broad central Asia to Kazakhstan area west of Tian Shan Mountain,” explained Zhangjun Fei, BTI professor and lead author of this study. In addition to pinpointing the western apple’s origin, the authors were excited to discover that the first domesticated apple had also traveled to the east, hybridizing with local wild apples along the way, yielding the ancestors of soft, dessert apples cultivated in China today. “We pointed out two major evolutionary routes, west and east, along the Silk Road, revealing fruit quality changes in every step along the way,” summarized Fei. Ph.D. candidate Grant Thompson explains his research on soil bacterial communities in residential lawns during a poster session at the Fall 2017 Horticulture Graduate Field Review. The Graduate Field of Horticulture gathered in Jordan Hall at the New York State Agricultural Experiment Station (NYSAES), Geneva, N.Y. for the Fall 2017 Graduate Field Review. 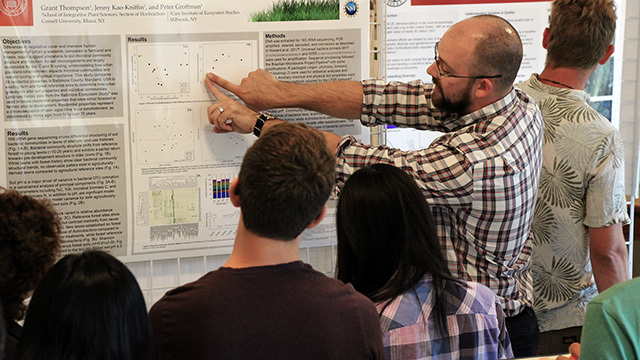 A dozen graduate students gave 2-minute “poster pitches” ahead of poster sessions where they detailed their research progress to faculty, staff and fellow students. Topics ranged from root exudates and reviving nut trees to post-harvest fruit- and flower-quality and Reisling grape clone trials. Two students gave longer talks on their research into grape cold hardiness and apple acidity genetics. The Horticulture Graduate Field Review is held twice a year just ahead of the start of Spring and Fall Semester classes. Graduate Field of Horticulture, August 17, 2017, Jordan Hall, Geneva. 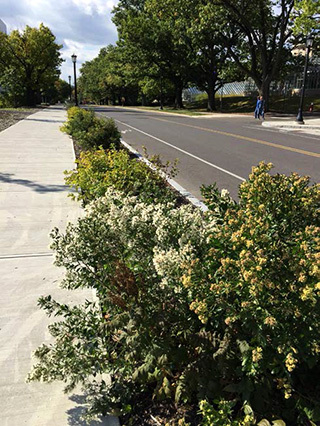 Nina Bassuk, professor, Horticulture Section, and Peter Trowbridge, professor, Department of Landscape Architecture, will lead a course for landscape architects September 15, 2017, on the Cornell University campus. 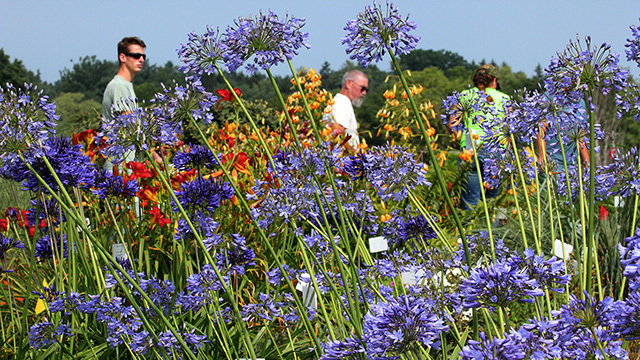 The participants will learn about best plants for challenging site conditions, plant selection for specific sites, site assessment techniques, and key resources for plant selection and design considerations. They will also tour the Cornell campus to see successful plantings, examples of site remediation and incorporation of research results in the landscape. Class size is limited to 25. Cost is $185 and participants can earn up to 4 LA CES Learning Units. Christine Smart, a professor of plant pathology who specializes in the development of management strategies for vegetable diseases, has been appointed director of the School of Integrative Plant Science (SIPS). She began her tenure Aug. 1. Smart had been serving as interim director since July 1, 2016, when Alan Collmer, the Andrew J. and Grace B. Nichols Professor in the SIPS Section of Plant Pathology and Plant-Microbe Biology, finished his two-year appointment as the inaugural director. ‘Enchanted Myanmar’ is a trip open to alumni and friends of Cornell that will celebrate 50 years of field-based learning of Cornell’s first and longest-running experiential learning course. Above, students explore the floating gardens at Inle Lake by boat during a trip to Myanmar in January. Alumni and friends of Cornell will have the opportunity to visit sacred and historic sites, plantations and more on a trip to Myanmar over the winter break. The trip, “Enchanted Myanmar,” also celebrates 50 years of field-based learning in Cornell’s first and longest-running experiential learning course: International Agriculture and Rural Development 602 (IARD602). 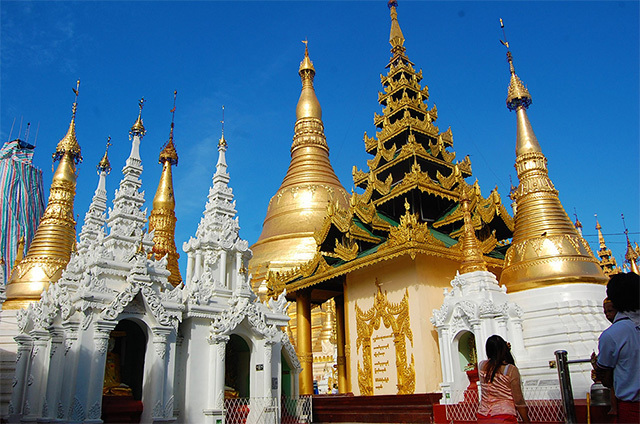 The Shwedagon Pagoda in Yangon which stands more than 300 feet tall and is covered with gold. 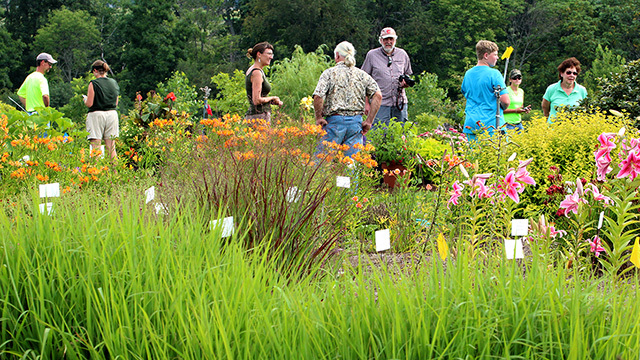 The School of Integrative Plant Sciences has hosted three field days in the last two days. 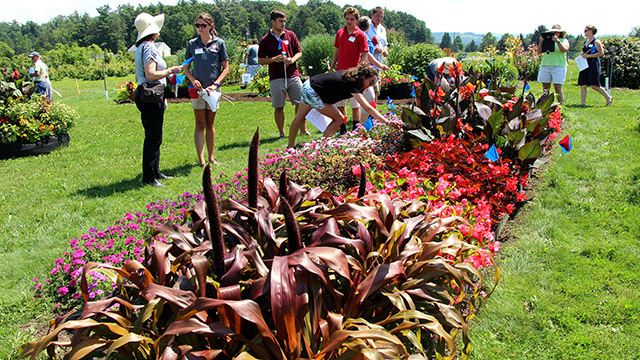 August 1 was the Floriculture Field Day, which attracted 90 growers, educators and others to a morning of presentations on campus followed by lunch, tours of annual trials and perennial flower plantings, and hands-on workshops at the Bluegrass Lane Turf and Landscape Research Center. Entomologist Scott McArt leads a session on pollinator-friendly gardens at Bluegrass Lane. Floriculture Field Day participants used flags to vote for their favorite flowers. Growers check out container plantings at Bluegrass Lane. 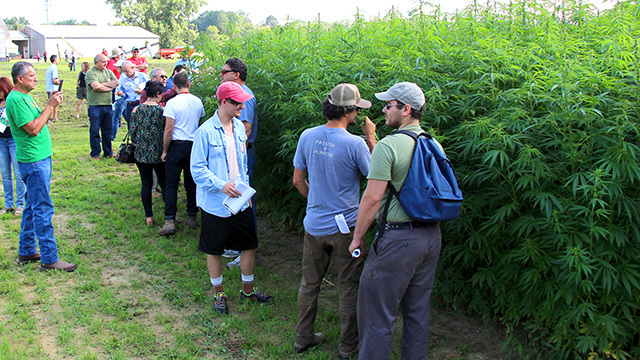 Also August 1, more than 100 people attended the Cornell Industrial Hemp Field Day at the NYSIP Foundation Seed Barn on Dryden Road. They got a close-up look at trials featuring 17 grain, fiber and dual-purpose industrial hemp varieties, and heard the latest from experts from Cornell and the New York State Department of Agriculture and Markets on potential pests and diseases, seed quality and other topics. Visit the Cornell Industrial Hemp website for more information. 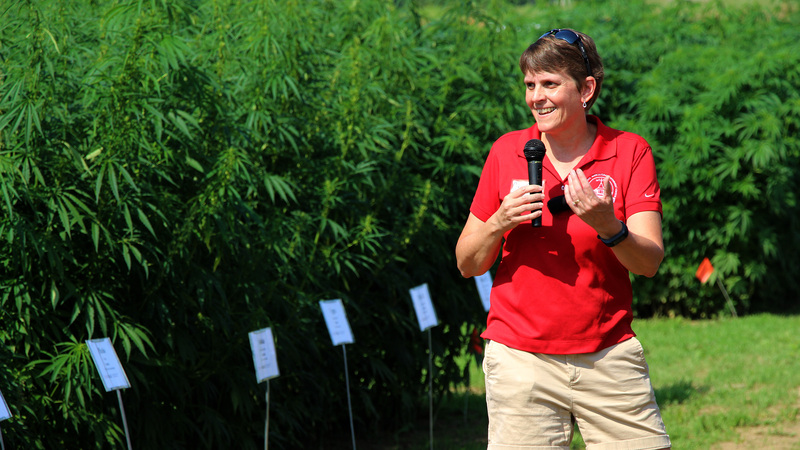 Chris Smart, director of the School of Integrative Plant Science, shares Cornell’s plans for industrial hemp research and outreach. August 2, horticulture researchers at Bluegrass Lane hosted an informal collaborative open house for nearly 100 SIPS, CUAES, NYSAES, and Grounds staff, students, interns and volunteers. 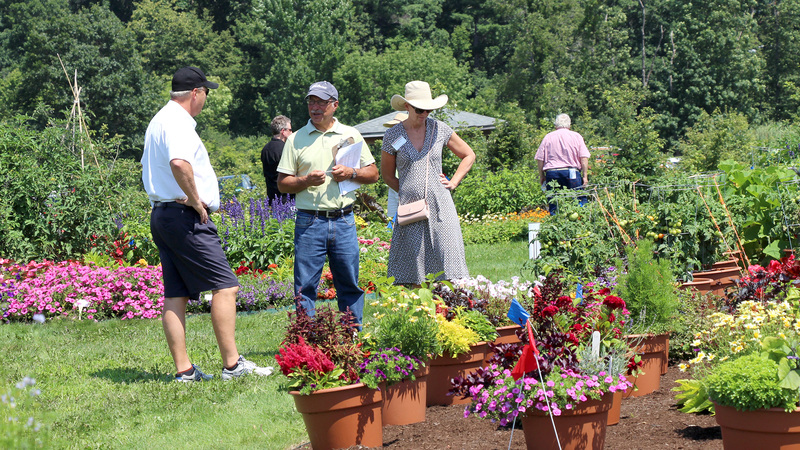 Attendees viewed trials of annuals and perennials, hybrid oaks, tree drought evaluation, David Austin Roses, and more. Bluegrass Lane and the Hemp Field Trials are managed by the Cornell University Agricultural Experiment Station (CUAES).